on Sunday evening, one person died while three others including a woman were injured. 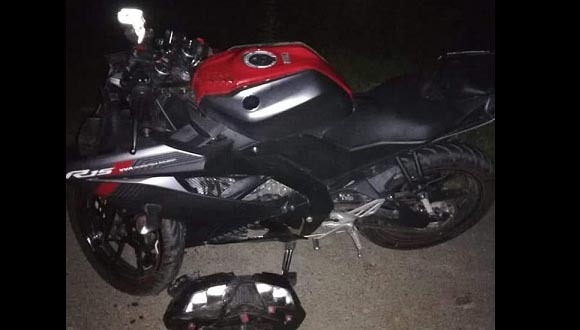 According to Hiranya Bora, Traffic Inspector, Tinsukia, the deceased has been identified as Prabin Karmakar of Tinsukia while Prince Gogoi, his friend Roktim Gogoi of Bapapung area in Digboi along with a girl were injured after two speeding Yamaha motorcycles collided. The deceased along with a female pillion rider on the Yamaha bike bearing registration number AS23P 8611 that the deceased was driving collided with another Yamaha bike (AS23U 4188) driven by Roktim Gogoi killing one on the spot while the three injured were immediately rushed to the nearby Tinsukia Civil Hospital. The injured were later shifted to a private nursing home in Dibrugrah for better treatment. According to latest inputs, the injured, who sustained multiple injuries, are reported to be out of danger. Terming the incident as the consequence of reckless driving, the traffic inspector said that the road mishap particularly incidents of reckless driving among the bikers have been on the rise which needs to be collectively contained by the parents through counselling. According to him, more than 5 road mishaps were reported on a single day here in Tinsukia on Sunday last.